The Big Wobble: Tropical Depression Four over the south-central Atlantic Ocean expected to become Tropical Storm Don heading for the Leeward Islands. Tropical Depression Four over the south-central Atlantic Ocean expected to become Tropical Storm Don heading for the Leeward Islands. The image above shows Tropical Depression Four over the south-central Atlantic Ocean early Friday morning, July 7, 2017. 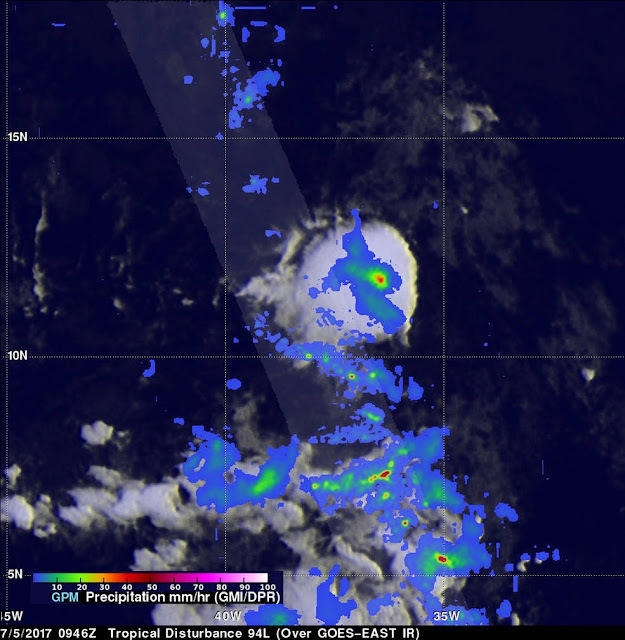 (NOAA/Satellite) Tropical Depression Four, which formed over the south-central Atlantic Wednesday evening, may become Tropical Storm Don prior to swinging north of the Leeward Islands. The tropical system will take a west-northwestward path over tropical waters through this weekend. The system is being guided by a clockwise flow associated with a large area of high pressure over the central Atlantic to the north. Fluctuation in strength of the system is likely. The system may slip below tropical depression status and could also become a tropical storm over the next several days. Into Friday, there is a chance the system becomes a tropical storm. "Beyond Friday, some weakening of the system is likely," according to AccuWeather Meteorologist Brett Rossio.